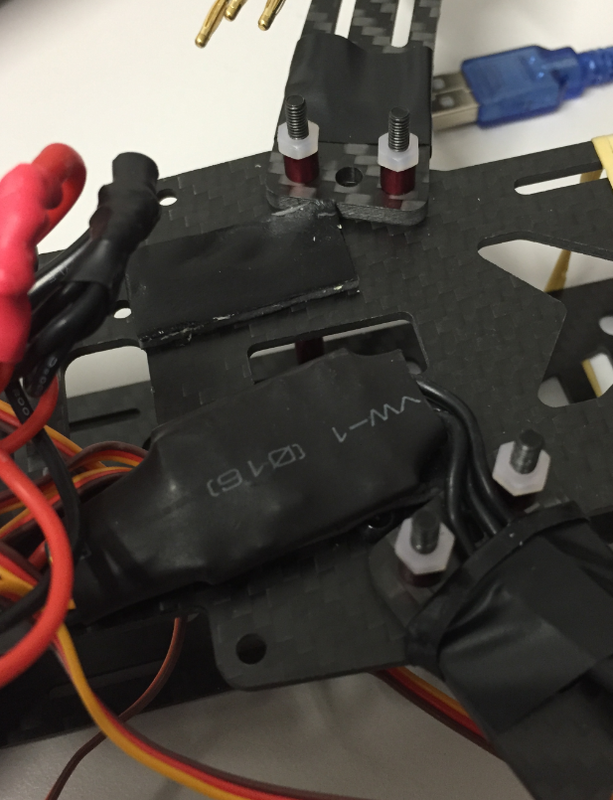 The four ESC’s are all in a rather tight compartment under the quadrocopter. And one of the ESC’s started producing heat, and did not drive the motor any more. The ESC’s are protected in heat shrink tubing to isolate and protect them. 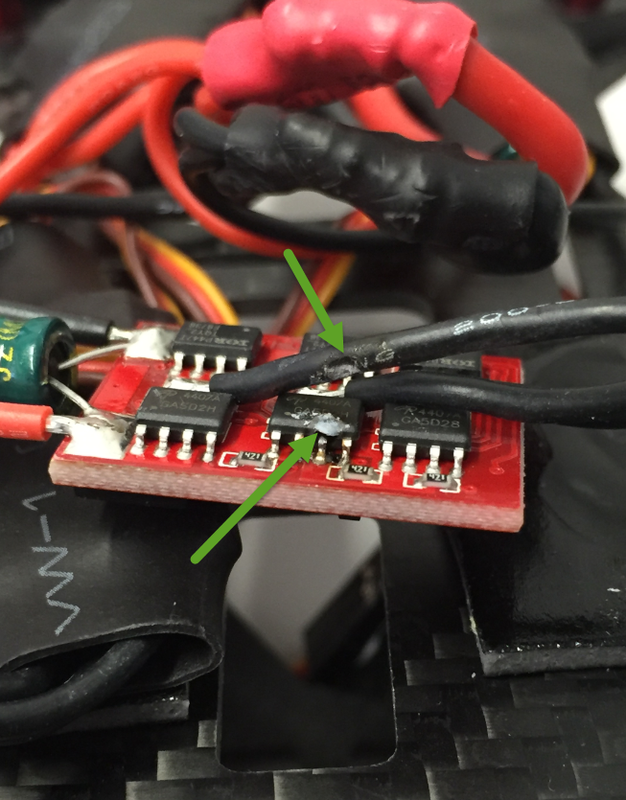 One of the motor wires of the Graupner S3055 ESC has been placed over the edge of one of the motor drivers. These drivers can get rather hot, and with the shrink-wrap and probably some pressure/vibration it was enough to ‘melt’ the cable isolation enough the reduce the isolation enough that it created some shortcut, melting away even some of the solder :-(. Interestingly, the wire isolation only seems to be ‘melted’ half way through, but that was enough to reduce the isolation enough. I will see if I can repair the ESC, or if I have to order a new one. In any case, it will take some time to have all motors spinning again. I think it is really a bad design to have the wires going over the motor drivers. I think I will open up the remaining ESC’s and make sure that the wires are not going over the motor drivers. And I’m always learning from failure :-). 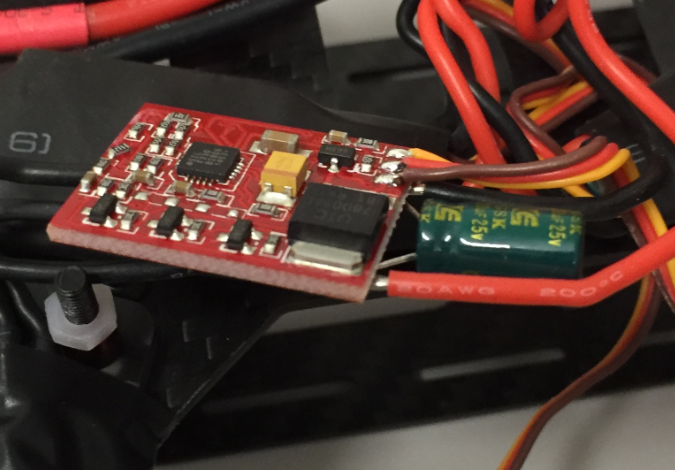 This entry was posted in Boards, Embedded, Graupner Alpha 250Q, Quadrocopter and tagged Quadrocopter, technology, Tips&Tricks by Erich Styger. Bookmark the permalink. can you put the smoke back in? Seriously though this tech is more dangerous than it seems, batteries can explode and cause house fires, propellers can cause serious lacerations or even take your eye out. No, the holy electronic smoke is gone, no way to back it in ;-). And you are right, this kind of stuff is not a toy and can cause serious damage. 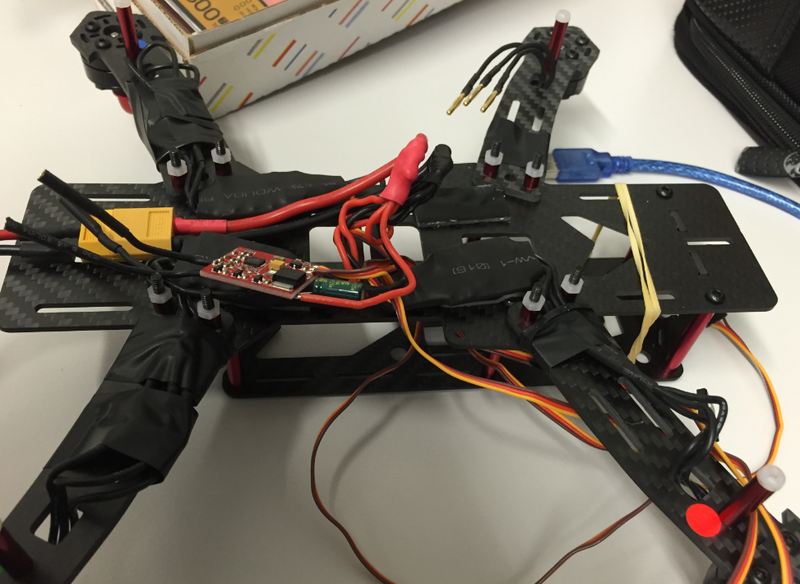 There is a lot of energy in the batteries, and the rotor blades can cut fingers. That’s why I’m using it without propellers in the current stage. And I’m planning to add some propeller protectors for the first flights. To protect the quadrocopter and the environment. We do have a special room for quadrocopter flying where there is a net between the robot and the operators for safety. Now you need to tell me about that pilot? Was working on my own Kinetis Drone as well. Gotta love multi-rotors, lots of fun to design & play with. Here are my kinetis ESCs as well: http://i.imgur.com/AAg1R0p.jpg . 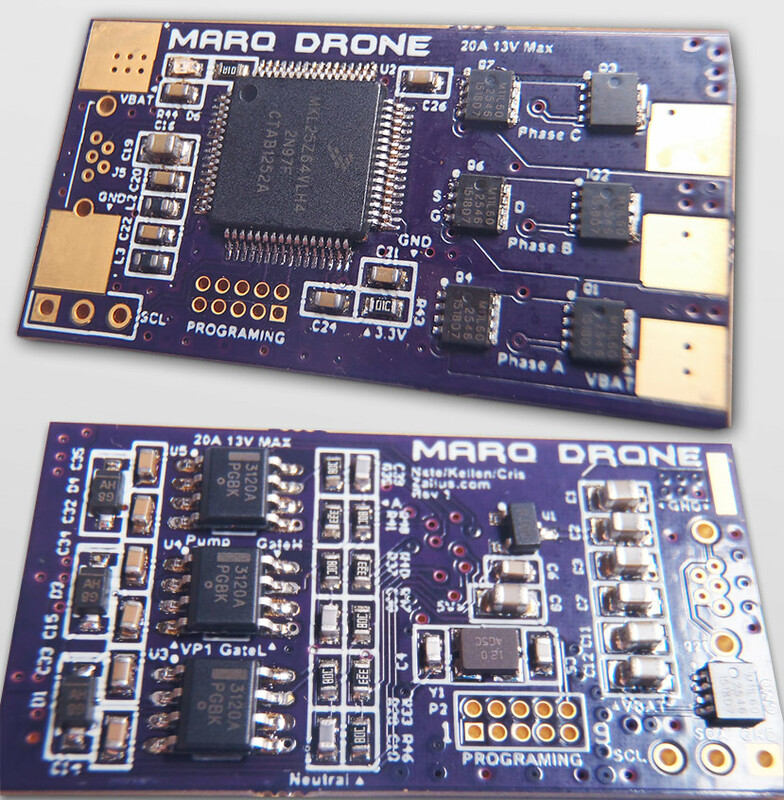 Working on the flight controller right now with the M4 K22 since they are nice & cheap. Many thanks for all your tutorials. Certainly helped me a few years back when getting started. glad to hear that I was able to help you out :-). And that’s a nice ESC, are they available somewhwere? I’m still developing them. Designing your own ESC from scratch is far more trouble than it is worth but I wanted to do it. Wasn’t a fan of the assembly+atmel escs so I wrote it in C & used a kinetis ARM core. Works alright but I wouldn’t hand them off to anyone yet till I do more verification of their performance. ah, I see. Yes, I agree to develop an ESC is not an easy task. I would be definitely interested in these, once they are awailable.